Cook ziti according to package directions; drain. Grease large casserole. Place layer of sauce in bottom. 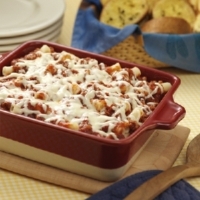 Add a layer of pasta; top with more sauce, 1/2 Ricotta mixture* and shredded Mozzarella; repeat layers. Bake at 350° for 40 to 50 minutes. 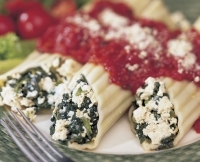 *Ricotta Mixture: Mix Ricotta with 2 beaten eggs, parsley, salt, pepper and garlic powder or salt. Note: Make sure there is ample sauce as pasta absorbs some as it cooks. Do not let dry out or overcook. 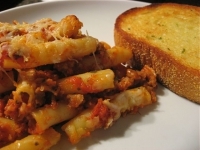 Recipe categories: Pasta, Main dish, Pasta, rice and grains.